If you like your canapés on the generous side, then these are the ones for you. Packed with a tasty Spanish-style filling, they add a continental twist to an old favorite. 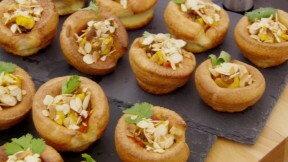 This Yorkshire tapas pudding recipe is featured in Season 4, Episode 4. Preheat the oven to 480F. For the Yorkshire puddings, add 1 teaspoon of oil to each hole of a muffin tin. Place the tray on the top shelf of the oven to preheat the oil. In a large mixing bowl, sift in the flour, salt, mustard powder and pepper. In a jug, combine the milk and 75g (2½oz) cold water. Make a well in the flour mixture and crack in the eggs. Whisk to combine (the consistency should be a very thick batter). Slowly add the milk mixture and whisk until the consistency of single cream. Decant into a pouring jug and leave to rest at room temperature for 30 minutes. Remove the preheated tins from the oven and quickly pour in about 5mm depth of batter into each hole, taking care to protect yourself from any splashes of hot oil. The oil should sizzle when the batter is poured in. Quickly return to the top shelf of the oven and bake for 15 minutes until browned and well risen. Don’t open the oven door until they are cooked or the puddings will collapse. Remove each pudding from the tin and place on a wire rack to cool. For the filling, put the stock cube in a measuring jug and add 200ml (7fl oz) boiling water. Mix until dissolved then add the saffron. Set aside. Heat the oil in a large frying pan set over a medium heat. Add the onion and cook for 5 minutes until soft and golden-brown. Add the chicken and cook for 3 minutes, or until the chicken is starting to brown. Add the chilli and cinnamon and cook for a few minutes. Add the saffron stock, cider vinegar, tomatoes, honey and sultanas to the pan and bring to the boil. Turn down the heat and simmer for 10 minutes to reduce the sauce. Pick 12 coriander leaves and set aside to use as a garnish. Finely chop the remainder and stir into the sauce. To serve, use a paring knife to cut a well in the centre of each pudding. Fill each Yorkshire with the filling. Scatter the toasted almonds on top and garnish with a coriander leaf.